Giovanni Gabrieli wrote countless Canzones in connection with his work as music director and principal composer at Saint Mark's Basilica in Venice. Like composers before and after him, he would use the unusual layout of Saint Mark's church, with its two choir lofts facing each other, to create striking spatial effects. Most of his pieces are written so that a choir or instrumental group will first be heard on one side, followed by a response from the musicians on the other side; often there was a third group situated on a stage near the main altar in the center of the church. Gabrieli utilized this as a tool for a dialogue between the different choirs and not least as a tutti effect where the music, so to speak, reached the listener from all sides. Canzone e Sonate 1615 is written for 22 voices, divided into five choirs: the first chorus is 6 voices, and the other four are 4 voices each. The range of pitches of the 22 celli match the original. It is recommended to play the work with a separate placement of the five choirs but in such a way that the balance of the whole ensemble is not restricted. 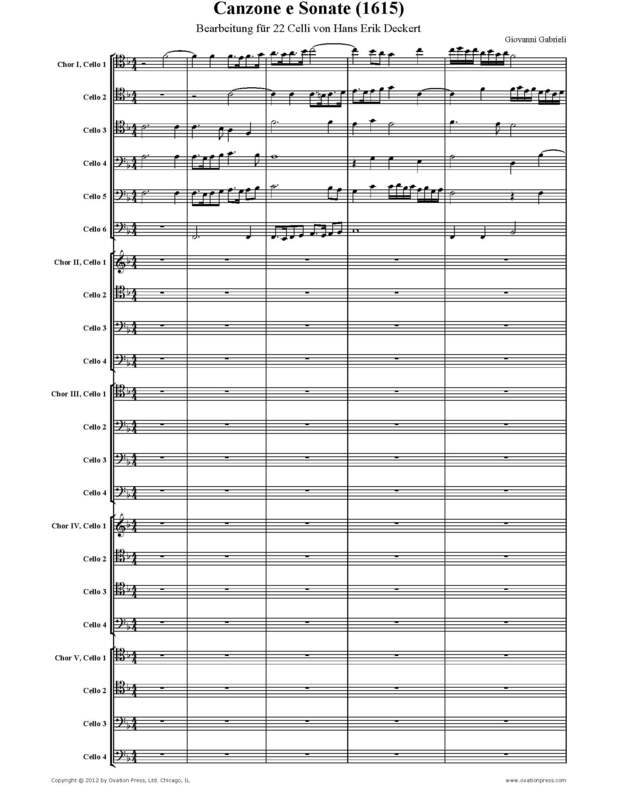 Please note: The sheet music for this work includes a full score, five choir scores for each of the five choirs to use in rehearsals and individual parts for the 22 celli.